As NASA continues preparing for the Journey to Mars, the technology now in development is expanding beyond the spacecraft and propulsion systems needed to get there. NASA scientists and engineers also are developing systems to harness abundant resources available in the solar system to support these pioneering missions. The practice is called in-situ resource utilization, or ISRU. Like early European settlers coming to America, planetary pioneers will not be able to take everything they need, so many supplies will need to be gathered and made on site. The concept focuses on how to turn a planetary body’s atmosphere and dusty soils into everything from building materials for shelters on Mars to rocket fuel for the trip back to Earth. Much of this work is taking place at NASA’s Kenney Space Center in Florida. Center Director Bob Cabana recently explained that the agency is moving to a new era in space travel. Cabana noted that explorers leave a nice, safe environment. They go off to an extreme environment for a short period of time, gather information and return. In the agency’s first half-century, the focus was on quick trips to space for hours, then days followed by weeks, primarily close to Earth and the moon, just a few travel days away. 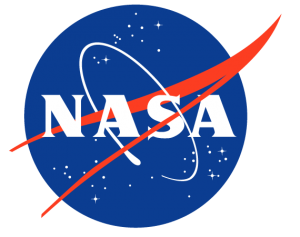 Since November of 2000, NASA and its global partners have participated in the next phase by establishing a permanent presence in low-Earth orbit aboard the International Space Station where astronauts are learning to live and work in space for longer periods of time. “We now want to go to Mars,” Cabana said. A mission to the Red Planet would be about six to nine months each way, plus the time spent on the surface. That would be without the benefit of frequent resupply missions, making it all the more important to use available resources. Dr. Jim Mantovani, a Kennedy planetary scientist and granular physics researcher, spoke of the challenges of developing ways to use ISRU as a stepping stone to Mars. “The goal of ISRU includes making consumables for life support and propellant for rockets,” he said. Mantovani pointed out that the equipment must be able to operate in the punishing surroundings of distant worlds. Near the poles of Mars, temperatures can plummet to minus 195 degrees Fahrenheit. However, near the Red Planet’s equator, a summer day could be a pleasant 70 degrees. The atmosphere on Mars is about 95 percent carbon dioxide. “To (use ISRU resources) on a remote planet or an asteroid, the systems need to be very reliable,” he said. Rob Mueller, a senior technologist in the Spaceport Systems Branch of Exploration Research and Technology Programs at Kennedy, believes that in spite of the extreme environment, the atmosphere and soil will prove useful. But a crucial decision will involve landing humans where robotic probes have found the needed resources. That orbiter may be similar to the Mars Reconnaissance Orbiter circling the Red Planet searching for evidence that water exists on the surface. 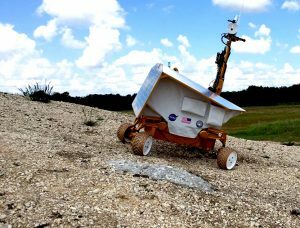 When areas prove promising, Mueller says the next step is using rovers on the surface to confirm the presence of needed resources. In the meantime, NASA’s Resource Prospector mission aims to be the first mining expedition on another world, building on the findings of NASA’s Lunar Crater Observation and Sensing Satellite (LCROSS) and Lunar Reconnaissance Orbiter (LRO) missions. “Our objective is to go to the moon’s poles where the LCROSS and LRO missions told us that what we previously thought was a dry moon is actually a quite moist moon,” said Jackie Quinn, Kennedy’s project manager for Resource Prospector. The Resource Prospector mission could potentially launch toward the moon early in the 2020s. The robot will use instruments to locate elements at a lunar polar region and excavate and sample resources such as hydrogen, oxygen and water that could support human explores orbiting above the moon or on their way to destinations such as Mars and farther into the solar system. The technologies and operations capabilities that Resource Prospector validates also could help determine how to someday harvest resources on Mars, an asteroid or other planetary bodies. 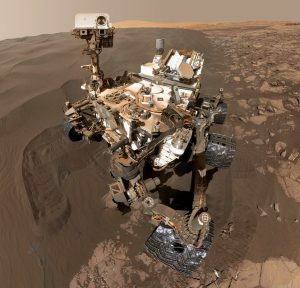 Once resources are confirmed, astronauts will need tools to harvest enough regolith to construct shelters and manufacture rocket fuel, as well as extract water from ice on the Martian surface. Regolith is the layer of loose or dusty unconsolidated rocky material covering bedrock. According to Mueller, NASA had to find a new way to dig on low-gravity planets. Gravity on Mars is 62 percent lower than that of Earth. As a result, excavators do not need to be as big as their counterparts on Earth. 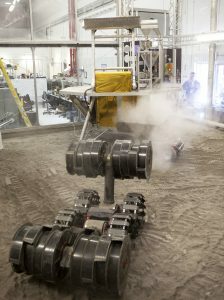 Mining for resources may be performed by a robot called RASSOR, for Regolith Advanced Surface Systems Operations Robot. “It can’t take one big scoop but takes lots of small scoops,” Mueller said. He noted that the basic technology is not new, just the application. Once the miner has collected regolith, it is then processed to create water, hydrogen and oxygen. The regolith also could be put to use in three-dimensional printing of shelters and other structures. This printing process refers to processes used to create an object of almost any shape or geometry in which successive layers of material are formed under computer control. Another need of deep-space traveling astronauts is food. 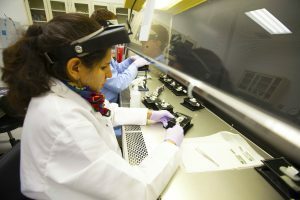 Dr. Gioia Massa, a Kennedy project scientist in the space center’s Exploration Research and Technology Programs Directorate, researches food production in space. Massa has helped lead successful efforts studying plant growth aboard the space station. 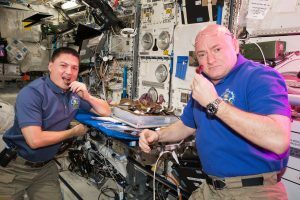 NASA researchers on Earth and aboard the station are working to find optimum growing environments for plants and crops including lighting, nutrients and watering, all while dealing with microgravity. Plant growth research also includes finding ways to produce food autonomously, freeing up crews to focus on their mission. 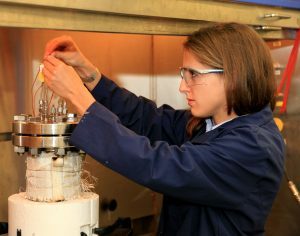 As a Kennedy chemical engineer, Annie Meier is part of a team developing a technology that could turn ordinary debris and other garbage accumulated by a crew of astronauts into valuable resources. The trash reactor being tested at Kennedy can hold more than three quarts of material and burns at about 1,000 degrees Fahrenheit, about twice the maximum temperature of an average household oven. The end result is useful elements. Experiments have shown that 10 pounds of trash could be converted into seven pounds of rocket fuel. Other valuable byproducts of the trash reactor include oxygen and water. The resulting savings are significant. Making about two pounds of fuel on Mars saves about 500 pounds launching it from Earth to get it to the Red Planet. The greatest challenge for missions of a year or more is becoming Earth independent. Projects that focus on resource utilization are part of ongoing efforts to do just that, moving from space exploration to pioneering.